This new work by one of Britain’s most prolific historians of the Second World War, throws added light on the motivations and behavior of Hitler’s leading henchmen with regard to a number key issues in the Third Reich, including the war against the Jews. Interspersing cogent analysis with quotes from their pretrial interrogations, a web of complicity is drawn, leaving no doubt about how and who implemented the Holocaust. Not surprisingly, higher-ups like the ideologue Alfred Rosenberg or the Governor of rump Poland Hans Frank vehemently denied any part in the genocide of the Jews. They admitted their anti-Semitism, but they distanced themselves from any involvement in murder. Even SS-General Erich von dem Bach-Zalewski, who was in charge of putting down the Warsaw uprising, tried to convince his interrogators that he had attempted to warn the Jews of Ukraine of the murderous intent of his superiors. According to Overy, in appearing as a witness for the prosecution, Bach-Zalewski demonstrated that he was actually in part successful. Less able to deny their participation, lower level perpetrators provided the essential details of the Holocaust that gave a hollow ring to the denials of their superiors. The accounts of Adolf Eichmann’s notorious aide, Dieter Wisliceny, and Otto Ohlendorf, commander of Einsatzgruppe D were particularly damning. As Overy notes, they probably revealed their roles in the Nazis’ murderous enterprise in order not to let their superiors off the hook. This deadly cocktail of uncritical prejudice, moral abdication and reflexive violence produced a casual indifference to suffering and an easy familiarity with pervasive morbidity of the camps.” (p. 198). In her important new study on U.S. policy towards genocide, Samantha Power argues successfully that government leaders have consistently thwarted the efforts of activists and a few brave officials in moving our government to prevent it. 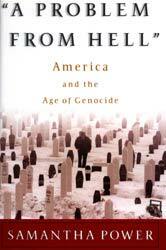 Through dogged research and interviews with key players, she shows how this was as much the case in the Armenian Genocide and the Holocaust as it was more recently in Cambodia, Iraq, Bosnia, and Rwanda. However, as Power demonstrates, not only public officials have been responsible for the lack of action. Public apathy has fed official inertial, as well. As Power writes: “Because so little noise has been made about genocide, U.S. decision makers have opposed U.S. intervention, telling themselves that they were doing all they could do – and, most importantly, all they should – in light of competing American interests and a highly circumscribed understanding of what was domestically ‘possible’ for the United States to do (p. 509).” Still, as Power sees it, this is where political leadership should have broken the ring of inertia. Regrettably, elected officials, from the Oval Office on down, rather than mobilizing public opinion in favor of action have consistently concentrated their efforts on trying to restrain it. A good deal of Power’s study is devoted to the groundbreaking work done by the Polish-Jewish legal scholar and activist, Raphael Lemkin, who coined the term genocide. Originally outraged by the lack of international action in the killings and “ethnic cleansing” of the Armenian Massacres (as this undeniable act of genocide was then called), he came to believe that only by making such crimes illegal under international law was there a chance that they could be prevented from occurring in the future. Himself a refugee from the Holocaust, with 49 members of his family murdered, Lemkin intensified his efforts into a crusade. He quickly determined that his quest required a new word to describe what had happened to the Armenians and Jews. In the end, Lemkin’s crusade did at least achieve the partial success of the passage by the United Nations General Assembly in 1948 of the Genocide Convention. Nevertheless, as Power c1early and repeatedly shows , Lemkin could not know that “the most difficult strugg1es lay ahead. Nearly four decades would pass before the United States would ratify the treaty, and fifty years would elapse before the international community would convict anyone for genocide. (p. 60).